Thanks to Dr. Ankur Sangoi, El Camino Hospital, Mountain View, California (USA) for contributing this case and Dr. Nicole K. Andeen, Oregon Health & Science University (USA) for writing the discussion. To contribute a Case of the Week, first make sure that we are currently accepting cases, then follow the guidelines on our main Case of the Week page. (1) Visit us at Booth #310 at CAP '18 on October 21-23 and say hello to Dr. Pernick and staff. Pick up color copies of our What's New newsletter. Give us your feedback about the website. Get your picture taken for our Facebook page. Tell us why you like PathologyOutlines.com for our YouTube video page. Authors can pick up our PathologyOutlines.com baseball cap. Our Editor-in-Chief, Editorial Board Members and staff will answer your questions about being an Author. (3) There are 3 major ways to find information on our website. First, use the search box in the Header in the upper right. It initially lists any topics containing your search terms. Second, scroll down and click on the appropriate textbook chapter, then review the Tables of Contents for that chapter and click on the appropriate topic. Most chapters have a table of contents organized similar to a textbook followed by an alphabetical list of topics. 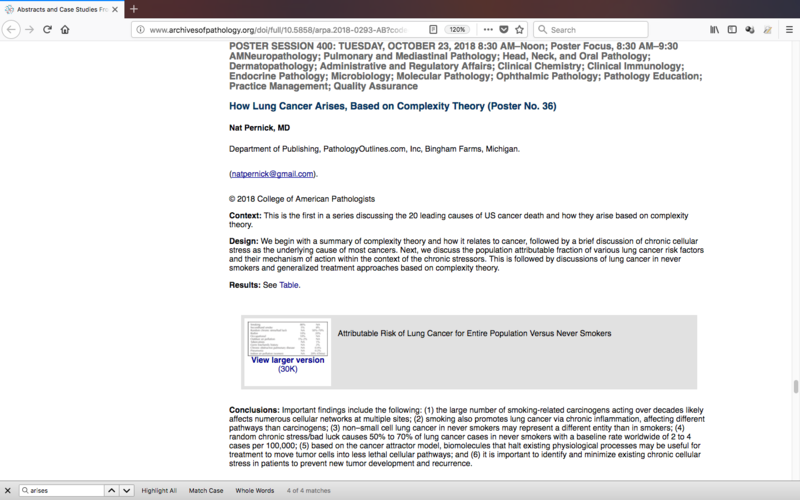 Third, some users go to Google or their favorite search engine, then type the search term followed by PathologyOutlines.com. 70 year old woman, history unknown, with bladder tumor resection (TURBT). Which of the following is true about lipid cell variant of urothelial carcinoma? 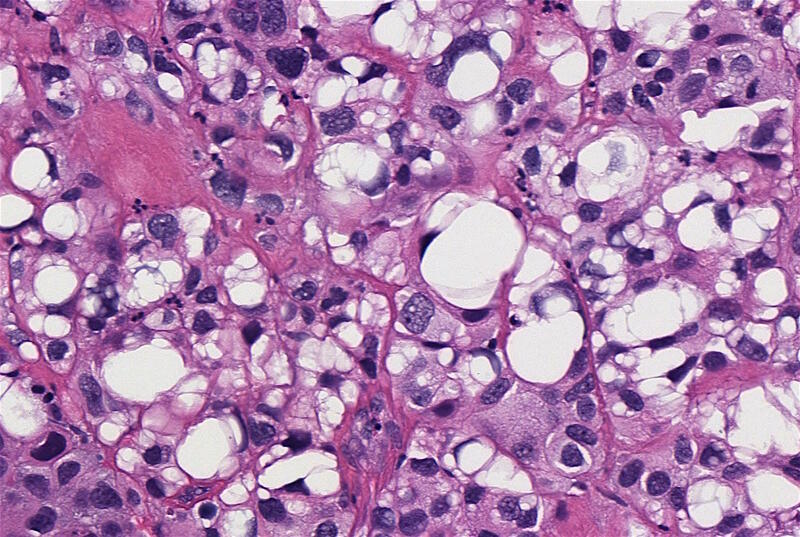 Lipid cell (lipid rich, lipoid cell) variant of urothelial carcinoma (UC) is an uncommon WHO recognized variant of invasive urothelial carcinoma characterized by large signet ring lipoblast-like cells with single or multiple clear cytoplasmic vacuoles indenting the nucleus (Eur Urol 2016;70:93). It is primarily seen in men, median age 74 years, who present with hematuria (Am J Surg Pathol 2010;34:371). Lipid cell variant of UC has been described predominantly in the bladder, with rare cases in the ureter and renal pelvis (Am J Surg Pathol 2010;34:371, Case Rep Oncol 2015;8:515, Am J Surg Pathol 2007;31:770, Pathology 2016;48:388, Journal of Clinical Oncology 2018;36:487). Distinct macroscopic features are not well documented. Microscopically, it coexists with high grade conventional and papillary UC, and shows identical loss of heterozygosity (LOH) patterns with the coexistent conventional UC (Am J Surg Pathol 2010;34:371), supporting a shared clonal origin. The cells express panCK, CK7, CK20 (variable), EMA, thrombomodulin (variable) and are negative for S100 and vimentin (Am J Surg Pathol 2010;34:371). The presence of lipid has been supported by ultrastructural studies; this component comprises 10 - 50% of the tumor (Am J Surg Pathol 2010;34:371). 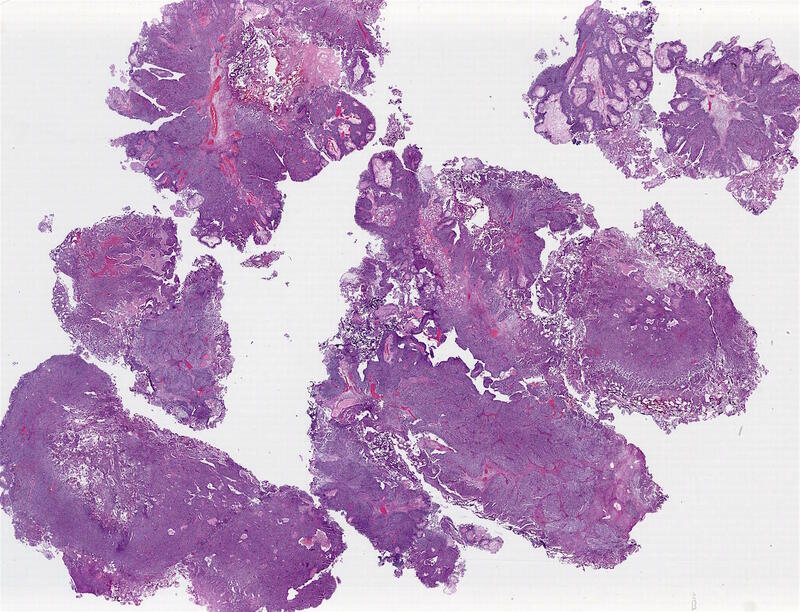 Other urothelial carcinoma variants, particularly micropapillary or plasmacytoid variants, may coexist with the lipid cell variant (Case Rep Oncol 2015;8:515, Am J Surg Pathol 2010;34:371, Journal of Clinical Oncology 2018;36:487). In a multi-institutional study of lipid cell variant of UC, the 27 studied patients usually presented at high stage and had associated poorer outcomes; 60% had died after an average of 33 months (Am J Surg Pathol 2010;34:371, Eur Urol 2016 Jul;70:93). Treatment is similar to conventional high grade invasive urothelial carcinoma. The differential diagnosis of lipid cell variant of UC includes clear cell (glycogen rich) urothelial carcinoma, adenocarcinoma with signet ring features, sarcomatoid carcinoma and liposarcoma. Clear cell UC contains intracytoplasmic periodic acid-Schiff (PAS) positive and diastase sensitive glycogen, rather than lipid, and lacks lipoblast-like nuclear indentations. 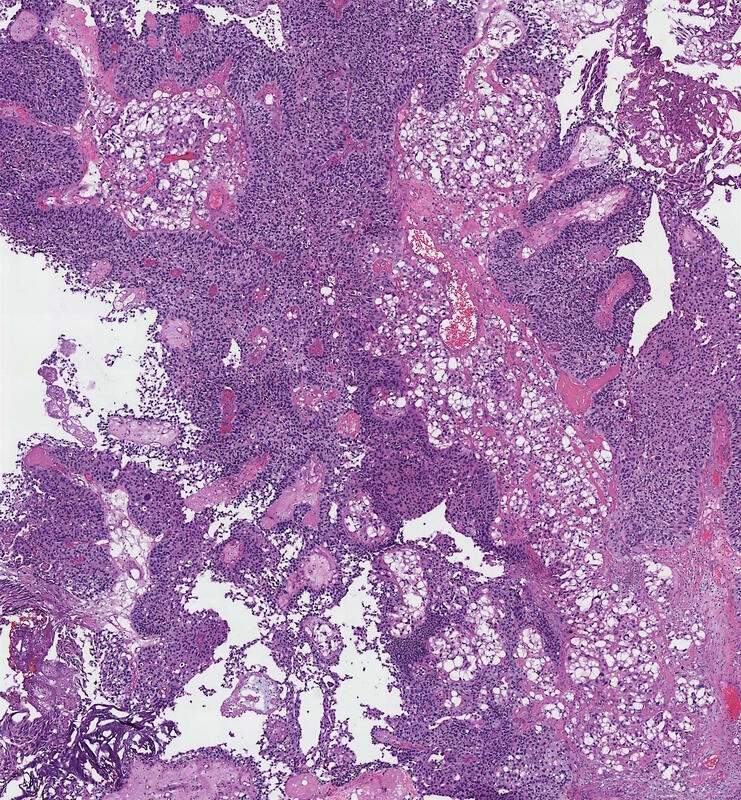 Signet ring features may be seen in urothelial carcinoma, particularly plasmacytoid UC and UC with glandular differentiation, the later of which often has areas with more enteric histology and immunophenotype reminiscent of colonic adenocarcinoma. Signet ring features may also been seen in metastatic carcinomas. 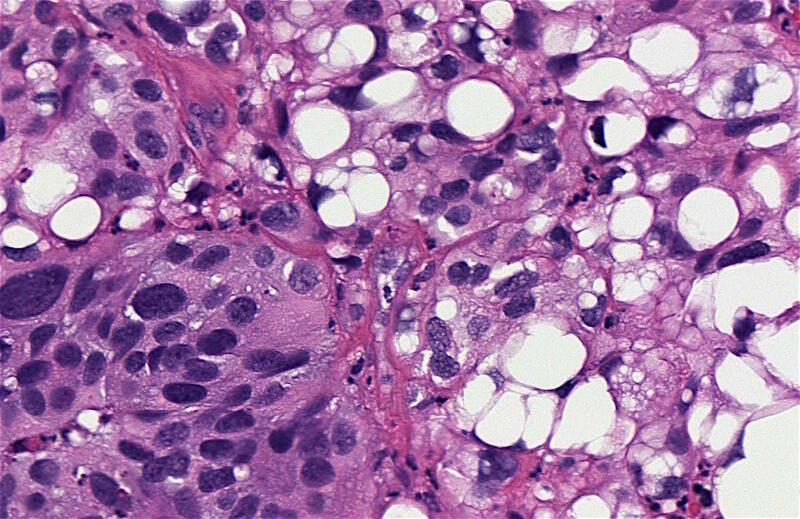 Unlike some signet ring adenocarcinomas, lipid cell variant of UC is consistently negative for mucin (Am J Surg Pathol 2010;34:371) and has areas of conventional UC, distinguishing it from a metastasis. 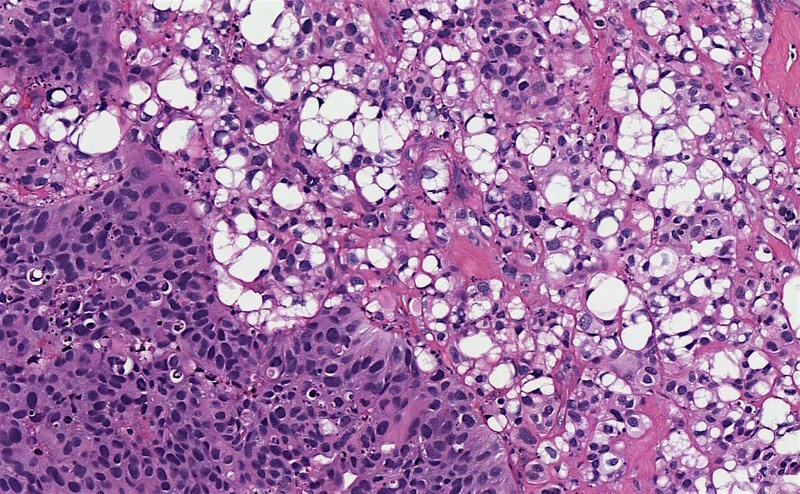 Although sarcomatoid carcinoma may have heterologous liposarcomatous elements, lipid cell variant of UC lacks the prominent high grade spindled features of sarcomatoid carcinoma and does not usually coexist with the sarcomatoid variant. Finally, liposarcoma, either primarily or secondarily involving the genitourinary tract, may enter the differential. The presence of cytokeratin and CK7 positive lipoblast-like cells and conventional urothelial carcinoma point to the correct diagnosis of lipid cell variant of UC. D. The lipid cells express panCK and CK7 and are negative for mucin, distinguishing this entity from others in the differential diagnosis. 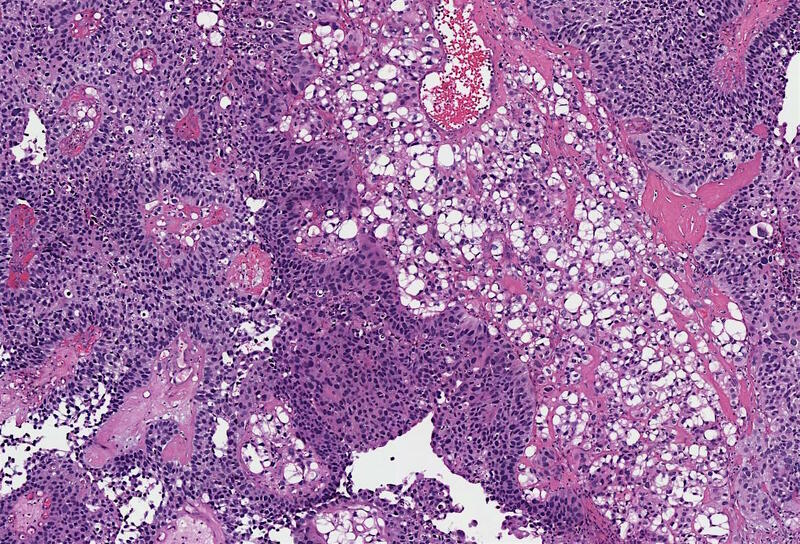 This and the presence of conventional high grade urothelial carcinoma are helpful diagnostic features in the differential diagnoses of lipid cell variant of urothelial carcinoma with adenocarcinomas with signet ring features, sarcomatoid carcinoma and liposarcoma.